Making more room for tomatoes. My tomato seedlings have really been growing the last week or two. It was time to move them out of the seed starting tray and into pots. While they’ll still have 3-4 weeks before they can go in the ground, they are developing root systems and leaves which will make them strong and healthy for the growing season. I did this repotting project indoors due to some wild wind outside. I put each tomato plant into a pot and made sure to label it before I forgot which type it was. I used to use peat pots for this step of the gardening process, but there’s been a lot of press lately on the topic of peat and it looks like there are now better alternatives available. I’ll be looking into this more as I current use peat moss as part of my raised bed filler. Perhaps there is a more sustainable option I can use. In the meantime, I’ve made the switch to these 100% peat-free renewable coir pots. They work the same way, and can be planted right into the garden just as I did with the peat pots. 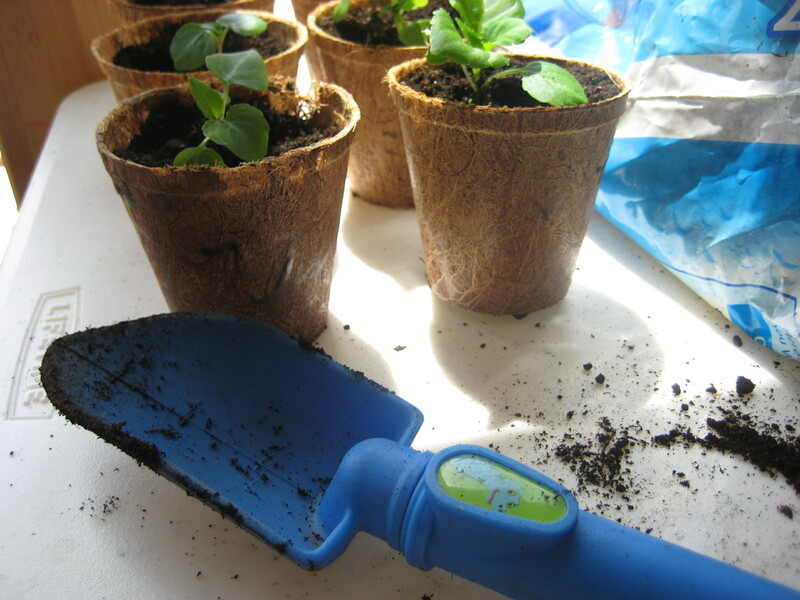 Here's a tip: A child's garden spade is just the right size for filling small pots with potting mix. In the above photo you can see I’ve also transplanted the impatiens I started from seed. Only 7 plants grew in my tray of 70! That’s a terrible germination rate… and now I’ll be buying a tray of impatiens at the garden center. 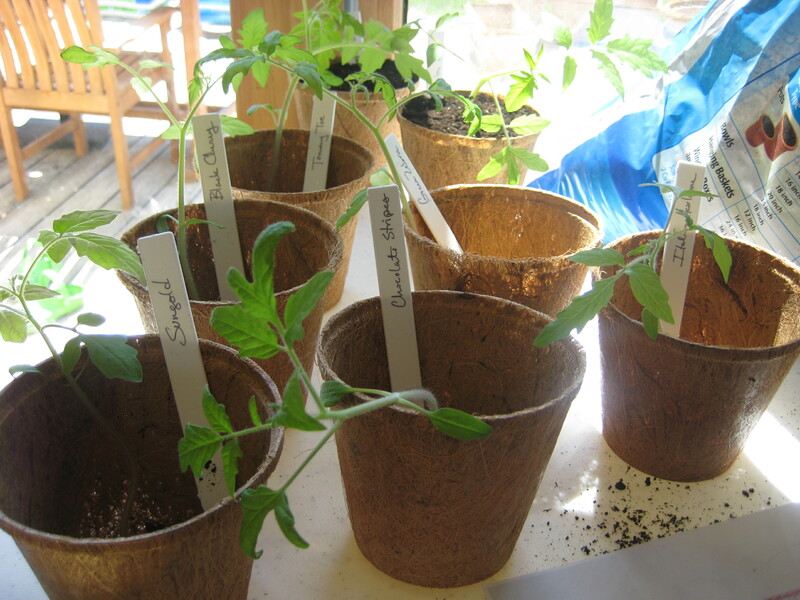 Here are the tomatoes, all potted up, labeled and now getting a drink of water from the tray they are sitting in. It's best to water from the bottom, and very easy if the plants are sitting in a tray. 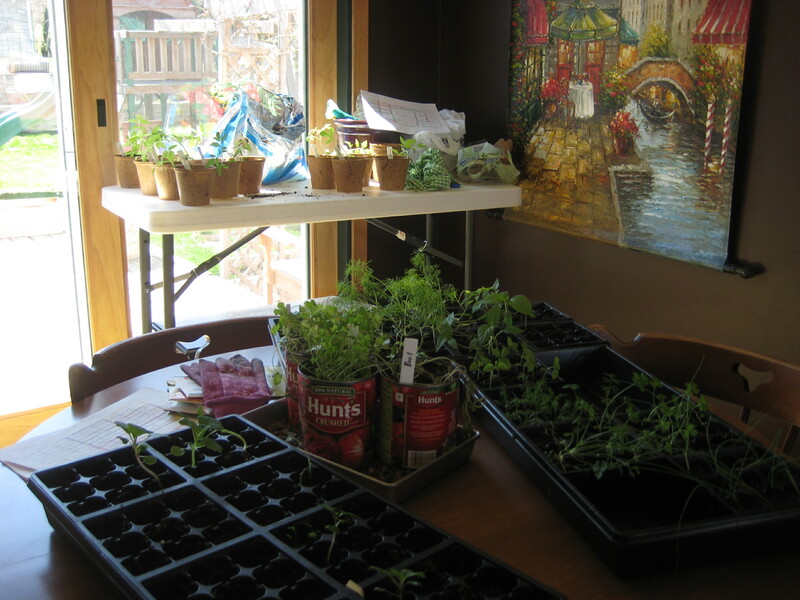 The tray will also make it easy to take them outside during the hardening off process.Tomatoes and other seedlings soaking up some May sun. 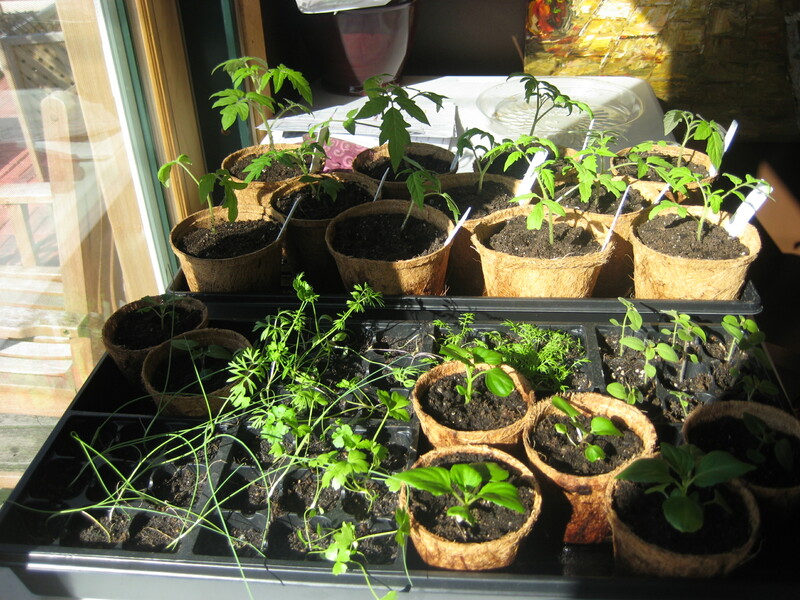 Tomatoes and other seedlings soaking up some May sun. 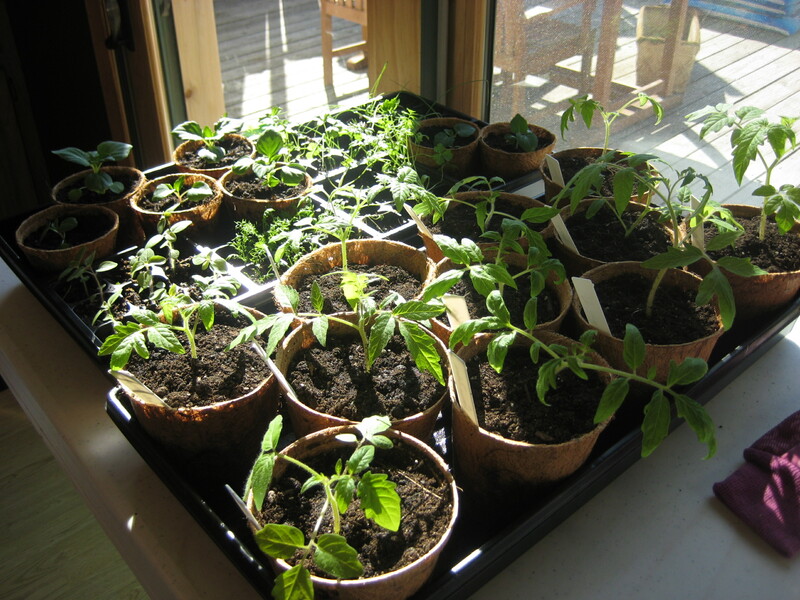 This entry was posted in Tutorial, Vegetables and tagged coir pots, peat pots, repotting tomatoes, seedlings, spring planting, tomato gardening, tomato seedlings, tomatoes. Bookmark the permalink. about that caprese salad you promised to make me this summer. Soon I will begin the process of amending my perennial garden soil ~ first turning over the dead leaves and then digging in nutrients. AJ–All of your perennials and plants always look so healthy. Is there something in particular that you put in your soil?